Great to see that local angler Jamie Needham has caught a Grayling from the River Irwell in the Bury area. Catching an Irwell Barbel is a special achievement , but catching an Irwell Grayling is akin to catching the impossible – well done Jamie. 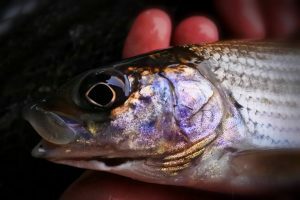 However, there is good news for Irwell anglers after a recent phone call from our local EA fisheries team … it looks as though The Irwell might be in line for a stocking of fingerling Grayling from the national fish farm at Calverton. There is lots of historical evidence of Grayling being caught in the Irwell dating back to the early 1820s and it’s going to be a great thing to see them making a comeback in the river. Watch this space for updates on when this restocking takes place. I am Rod Calbrade, General Secretary of The Grayling Society. We would be interested in knowing of the historical data of Grayling in these rivers and whether we can help with any re-stocking plans. Also, on a personal note, I love in Oldham and so the Irwell is closer to me that the usual rivers i fish!